We spent time in our session talking about an experimental method we have been developing for building new cell phone lists. As there is no phone book of cell phones in Canada many organizations struggle to build new lists of supporters’ cell phones at scale. At Stratcom, we have been working with many clients to execute such online lead generation and conversion programs, which we detailed in an earlier post. Our new tool for building cell phone lists is an evolution of an old tool used in public opinion research — Random Digit Dial (RDD). When conducting phone based surveys, researchers use RDD to ensure that their samples include both landlines and likely cell phones. RDD lists are developed by 1) generating all the possible phone numbers in a region based on area codes and exchange numbers, 2) scrubbing the RDD list of known landline numbers in the phone book, 3) scrubbing the RDD list of emergency phone numbers and other key listings in accordance with CRTC, 4) ensure the list is not dialed sequentially. The end result is a list of possible cell phone numbers, with our experience being that roughly 45% of the RDD numbers are active cell phones. In 2015 Stratcom started using RDD in campaign work to contact cell phone only households. Since then we have used live calling, Telephone Town Hall, peer-to-peer texting and Interactive Broadcast Voicemails to engage with our RDD lists for three provincial elections, one provincial plebiscite and two municipal campaigns. Records in an RDD list do not have names or addresses attached, and the only information you can add to an RDD record is the carrier it likely belongs to and the city or region where the number was originated (although the cell phone might not still be based in that geography). As such we have develop, tested and refined engagement scripts to maximize the number of responses we get and the information respondents provide. Recently we also developed a tool for constantly analyzing the call dispositions of engagements with cell phones so that we can score how likely blocks of RDD numbers are to be active cell phones and how likely they are to be in the region or city they were originated in. We are currently working with some clients to use smaller scale engagements of our RDD list to identify supporters who can then be used to build “Lookalike Audiences” in Facebook. This approach allows for cost effective RDD engagements to find new supporters’ cell phones, and as a cell phone is a data point by which you can build these Facebook Lookalike Audiences, we are then able to target a much larger online audience that should be receptive to ads, petitions and other posts that ask them to show their support and get involved. While we are in the early days of this tool, we have so far found impressive results. 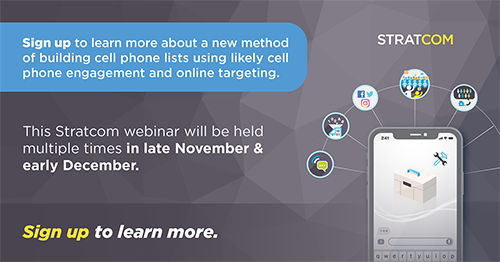 If you would like to learn more about RDD and our developing method of using RDD and Facebook to build new lists of supporters’ cell phones, then sign up for a webinar. And in the New Year we will be looking for interested early adopters who want to try a test program for reduced costs to help us develop this tool further.